This is your life with your dog. What you may not realize, however, is that your dog’s fence fighting behavior has a much more detrimental affect to your dogs emotional health than yours. Although many times we perceive that this is a “fun” behavior that our dogs enjoy, it is quite the contrary. 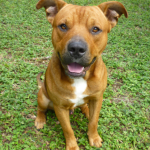 Routine fence fighting quickly becomes a compulsive type of behavior in dogs, which is far from healthy. 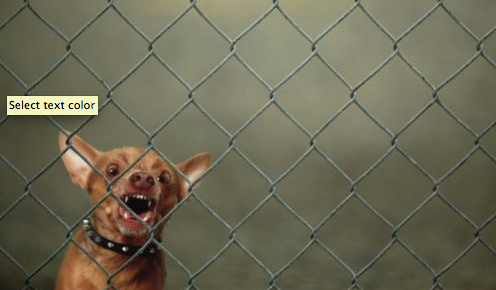 In fact, fence fighting often leads to dogs becoming aggressive with other animals and/or people. Every time your dog rehearses the lunging, growling, air snapping and barking he is practicing and being reinforced for inappropriate behavior. Can you really blame him for the times when he’s gotten snappy or assertive with an otherwise friendly dog you’ve met while out on a walk? Your dog being leashed becomes another barrier – another fence – meaning that your dog is likely to display the same behaviors on leash as he does with the dog on the other side of a fence line. Fence fighting isn’t just annoying, and it’s certainly not innocent. It is detrimental to having a well socialized, friendly, and neurochemically balanced dog. Neurochemically balanced? Yes. You read it correctly. What you may not realize about dogs is that when they get aroused, like during a fence fighting episode, it can take days for their neurochemistry to return to normal. Imagine if your dog fence fights everyday, or multiple times a day! Your dog could be living in a constant state of stress – distress! If you want to learn about how stress really affects dogs you can click here to read an awesome article by my good friends at Green Acres Kennels in Bangor, MA. 3. It’s just not healthy! This is by far the easiest and quickest way to eliminate or significantly decrease fence fighting. Out of sight, out of mind. If erecting a 6ft wooden fence isn’t in your budget I recommend installing green privacy mesh over your chain link fence. If you leave your dog outside unsupervised then there is no one to teach him that fence fighting is not a desired behavior. You should always supervise your dog’s activity when he’s in your yard. Take some tasty chicken or another high value treat your dog loves outside with you so that the next time your neighbor’s dog comes outside you can reward your dog for staying close to you instead of charging the fence. In addition to supervising your dog in the yard I strongly recommend that you get a comfortable fitting harness for your dog to wear when he’s in your backyard. By attaching a 25 foot training line to the harness you can quickly step on the line should your dog decide to tear off towards the fence line. You can literally put your foot down on unwanted behavior! Remember you should never attach a 25 foot line to a dog’s neck collar as a running dog hitting the end of a 25 foot line could potentially injure your dog. Always use a body harness for this strategy. It’s important that if your dog does decide to charge the fence you can quickly interrupt the behavior and prevent the rehearsal of your dog’s aggressive display. It’s worth every penny you’ll spend in buying some easy to solve dog food puzzles that can be provided to your dog when he’s out in the yard. Puzzles filled with dog treats will keep your dog busy and focused on more productive activities than fence fighting. If your dog likes to dig, you can even build him a sandbox to encourage alternative natural and fun behaviors your dog likes to do. Anything to keep him happy so he doesn’t feel bored or tempted to fence fight. If you find that you need a little extra help, you can find certified dog trainers through the Association of Professional Dog Trainers (www.apdt.com). It’s important you work with a trainer that is using positive dog training methods to modify your dog’s behavior. You dog isn’t dominant, he just doesn’t know better. It’s your job to teach him what’s better! 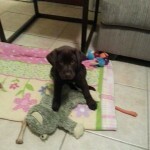 Need help with your dog or puppy in Miami or Fort Lauderdale? We serve all of Miami-Dade and Broward County. We are Miami and Browards expert dog trainers who can help you with obedience, behavior, aggression, house training, jumping up, pulling on leash, destructive dogs and much, much more. Email us at training@applauseyourpaws.com, follow us on instagram @doggiedeeva or give us a call at 786-529-7833 to schedule your first in-home consult. We turn dogs into AKC Canine Good Citizens. We have a wooden fence. This hasn’t been an issue until the old neighbors moved out and the new neighbors with their new dogs moved in. Little yappy, aggressively barking dogs. I don’t think that my dogs would tear up the fence (yes, literally tear giant holes in the fence), if those little dogs would be deterred from barking. I’ve repeatedly asked my neighbors to monitor their dogs and stop them from barking. I’ve had to resort to locking my dogs inside when I leave now. We’ve bought bark collars, which helps to stave barking back, but doesn’t deter the aggressive, fence destroying behavior. Pretty much have to replace the entire fence line at this point, but not until our neighbors do something about their yappy little beasts. Until then, our backyard is marred by a “ghetto” fence, as my husband has solved the destruction by screwing on sheets of plywood. Would a meet and greet solve this issue? And if so on whose yard? or Maybe on neutral territory? Need some viable suggestions.